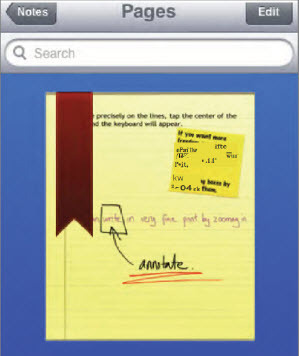 Adding a bookmark can help you break up a note set and allow you to quickly navigate to important pages. Step 1:Open the page to which you would like to add a bookmark.Step 2:Tap the Bookmark icon at the top of the page, then tap the + button. Step 3:Name your bookmark. Note that the bookmarks are organized by page number, not alphabetically by name. Tap Done when you are finished naming. 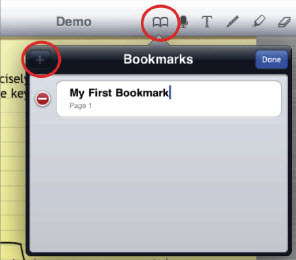 Step 4:Whenever you want to quickly open that page, tap the Bookmark icon and select the page from the list.